Birthday Gifting & Celebrations – keeping step with the modern India! For decades, a birthday celebration in the family was a fairly well-established process – someone was given the task of ordering a cake, rounding up some candles, order in some samosas or namkeen, and get out those disposable plates to serve it all in! The birthday boy (or girl) could expect to receive some gifts, wrapped in gaudy cellophane paper, embarrassedly handed over by friends and relatives (after all, we were not really used to gift-giving!). Relatives in other cities would mail in some cash or clothes, accompanied by greeting cards with an armload of graffiti. a) Cakes: The Indian palate has moved on beyond the ever-popular black forest or the chocolate variants, which had adorned the Birthday table for decades on end. Now we demand (and get!) an infinite array of goodies like Truffles, theme based cakes, photo-printed cakes, and even a range of delectable cupcakes! Truly, presentation and elaboration has taken center stage, when it comes to the humble Birthday Cake. 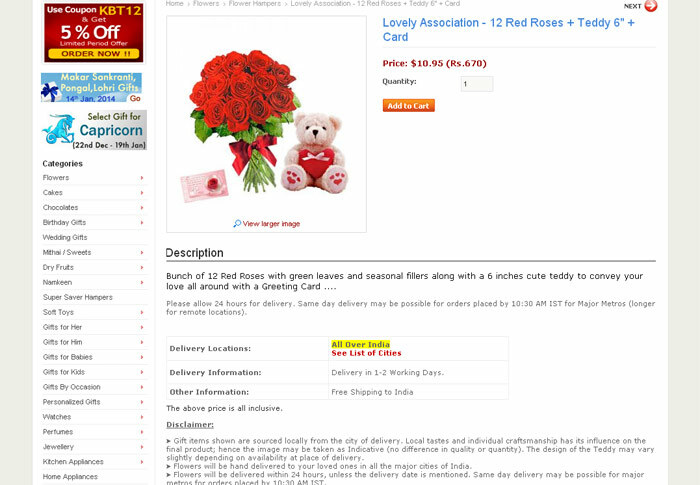 b) Greeting Cards: The Birthday card, a cornerstone of celebrations, has now become somewhat of a novelty for many of us. In the age of Facebook, Twitter and Instagram, we unfortunately lose out on the nostalgia aspect of old preserved greeting cards, collected over many years. Here’s where the discerning gift-giver can actually take efforts to send her message on a greeting card, and stand out from the jumble of e-greetings. c) Snacks: Well, samosas and namkeen are so passé – we now tend to order in, from our favourite pizza chain, or the friendly neighborhood food joint! Some of us have even started opting for catering services from the latest restaurants, depending on the scale of celebrations. d) Venue: For college age kids and the yuppies, the birthday venue has moved on from the drawing room of the home to the hippest pub or discotheque. After all, someone’s got to capture the perfect shot for our social networking friends! It’s clear that Birthdays are no longer a simple home-affair, in part due to our need to do a “keeping-up-with-the-Jones”, made all the easier thanks to social networking. 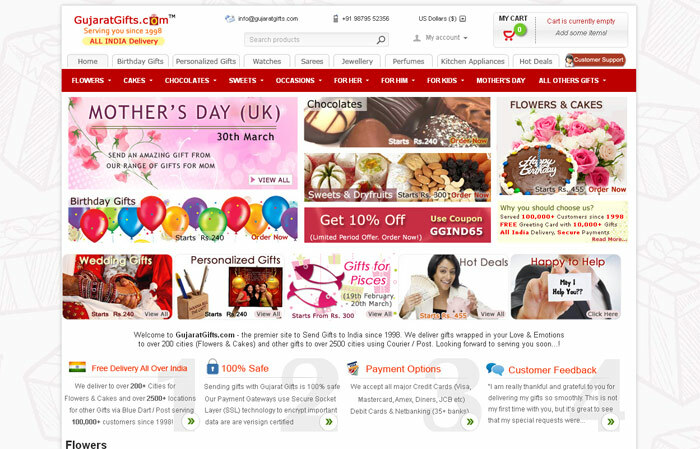 Online Gifting has given wings to this need, helping people send birthday gifts in the span of a few hours, with no physical shopping, gift wrapping or mailing – one can expect to send even elaborate cakes and goodies online from any corner of the world. Detractors do point out that such finger-tip conveniences take away from the care and personalization in doing things the old way; but there is no doubt that this helps keep relationships fresh, when there is a physical distance between friends or loved ones. So the next time when your favorite social networking site reminds you of an important upcoming birthday, and you choose to send online gifts; do remember to put in a lot of attention in making your gifts and messages as personalized as possible, and enjoy the best of both worlds! 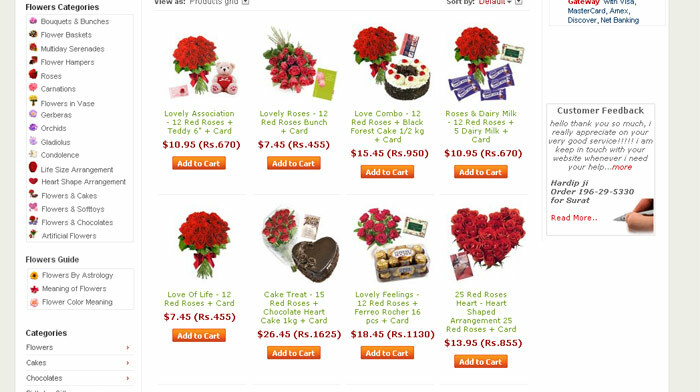 Gifting on a shoestring budget – a guide! All of us love to occasionally go all out and splurge for our loved ones, with a “money-is-no-object” attitude. However, there are times, when one wants to simply enjoy the pleasures of gift-giving, without putting too much strain on the wallet! The problem is that one needs to get appreciation for all the effort, without secretly getting labeled as stingy! 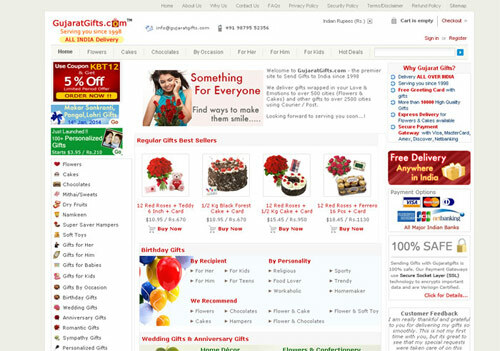 For all these times and more, we, at GujaratGifts.com come to your rescue. 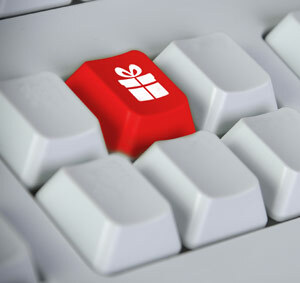 We have put together the following guide to help you navigate the tricky waters of budget-gift giving! All suggestions below will cost you a mere Rs. 500 (around Eight dollars). What’s even better is that these ideas have Free Shipping, plus they come with a Free Greeting Card, so you can lend just the perfect words to your gift! a) For the Husband / Wife: A clock personalized with a photo of the two of you, with a wooden stand, is sure to reduce your significant other to mush! You even get to write a few words to be inscribed on the clock. Price: A mere Rs. 485 / $ 7.95. 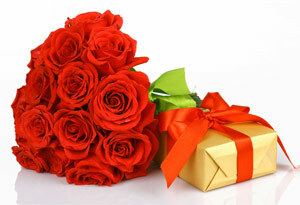 So go ahead and make his / her day, and wow your significant other with your thoughtfulness. b) For the Fiancee / Girlfriend / Boyfriend: We suggest a 7 day pack of fine Belgian chocolates, to shower them with sweetness on all days of the week. 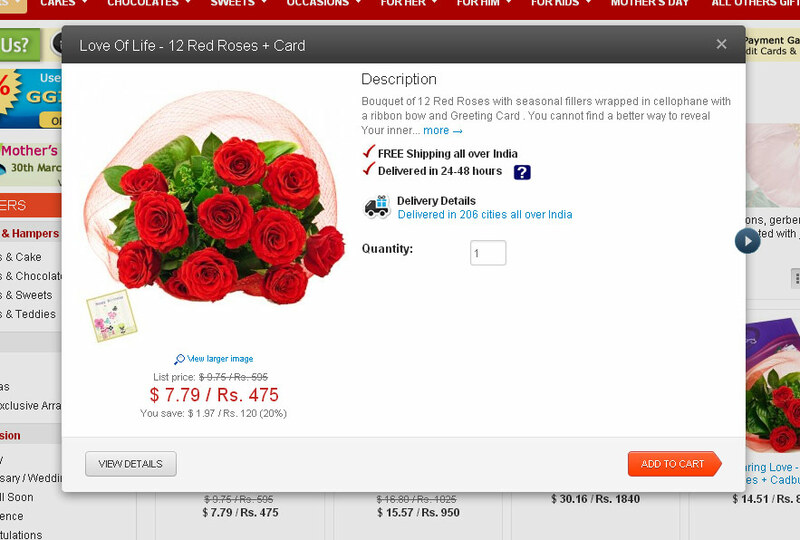 Before you worry too much about the price, let us tell you that this gift costs just Rs. 425 / $ 6.97. If you are feeling adventurous, you can choose a beautiful love-birds piece, which is vaastu-friendly too, at a mere Rs. 356 / $ 5.98! c) For Parents: An oxidized metal hexagonal pen stand is sure to find a place of pride on the desk of your father. And at just Rs. 365 / $ 5.98, it’s pretty economical too. 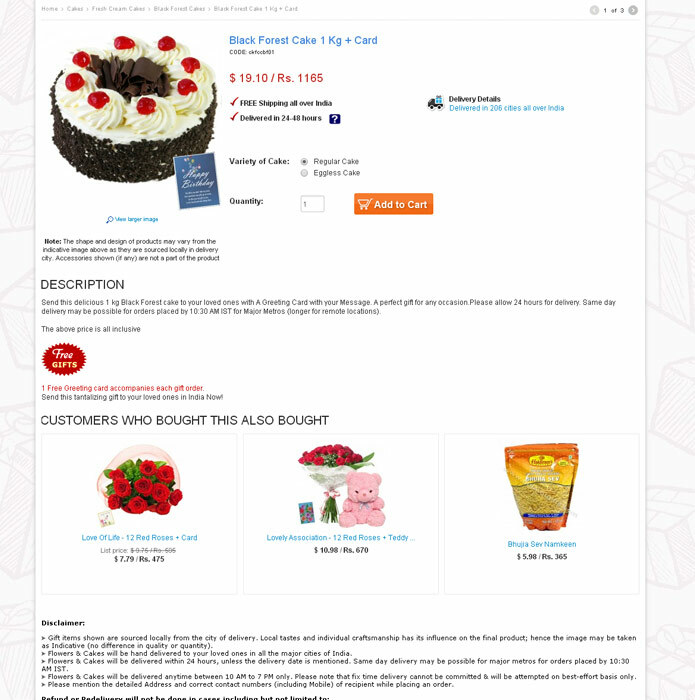 For mom, you can select a box of sonpapdi, which is just Rs. 335 / $ 5.49 as a way of appreciating her sweet nature and goodness. e) All Others: Even if you need to get a gift for your boss, neighbor, friend, or that lovable co-worker; we have just the things, despite the tight budget. So there you have it. Who says gifting ain’t cheap? We hope you enjoyed our suggestions, and look forward to serving you soon! Are Chocolates the new Mithai for Indians? We Indians are well known for our sweet tooth – after all, we do love to gorge on mithai, citing one excuse or another! We need our sweet fix on all festive occasions, celebrations, and even the humble dinner as dessert. No wonder we are a nation of almost 50 million diabetics, in part due to our fascination with anything sweet. On the positive side though, our range of mithai can give a run for the money to the best dessert and pastry chefs in the world – each state and region contributes to the ever growing list of these delicacies, loaded with sugar, ghee and a little bit of magic! 1) Standardization: Popular chocolate brands by companies like Cadbury or Ferrero Rocher give a fairly consistent taste over the years, something which even the best mithai shops in India struggle to do, especially during peak occasions. So buying a pack of chocolates doesn’t quite need the skills needed to hunt for just the perfect sandesh! 2) Flavors & Texture: There’s no denying the fact that Chocolates come in a wide range of flavors – bitter, sweet, fruit-filled and lots more. However, when it comes to the sheer range of aromas, texture and flavors, mithai is simply too hard to beat – just walk into any decent mithai shop, and prepare to get dazzled by the visual and olfactory delight! This is on top of the heavenly taste which leaves you wanting ‘one more’. 3) Diet friendly: While mithai shops have bucked to the trend, and started offering low-sugar, or sugerfree mithai, giving some relief to the dieters and diabetics; chocolates have the huge advantage of giving exact nutritional information on the packaging, allowing the consumer to see the exact ingredients, as well as calories, fat content, carbohydrates and more. There’s no denying that while there are chocolates loaded with calories, the mandatory nutrition label does allow the discerning consumer to know exactly what she is consuming. While some pre-packaged mithai offer these attributes now, the majority of mithai sold by the kilo cannot match this convenience. 4) Cultural Significance: Mithai is deeply embedded in the Indian culture and ethos, and is a must for important milestones like weddings, promotions, festive celebrations and more. Moreover, there is a certain romance in traveling to different corners of the country, and experiencing the cultural difference by consuming the local sweets made there; or getting a box for people back home. This aspect cannot be matched by the Chocolates produced in gleaming factories, and available wherever one might be. So there you have it – it seems to be a draw between these two favorites! While chocolatiers make a strong case for substituting mithai with their products, the ever popular mithai continues to hold onto its glory. Why choose when you can have both, we say, and leave the final decision to you. Check both these out, and decide for yourself! 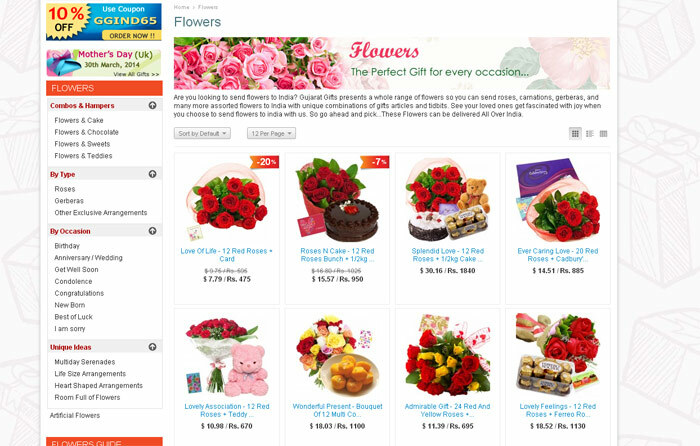 GujaratGifts.com relaunches with user-friendly interface! We are deeply grateful to you, our esteemed patrons, both new and old. Gujarat Gifts exists based on your support, all the way from 1998, when we were operating this service via phones and emails. 1) Cleaner, wider site with more products and information: A large majority of our customers now browse Gujarat Gifts from devices with ever higher resolutions, when browsing from non-mobile devices. Thus, we have increased the horizontal size of our website to 1025 pixels, and thereby accommodate more products and information per screen. 3) Better Top-Navigation Menu: The new drop-down menu now allows you to directly access categories even 2-levels-deep directly from one spot, without cluttering your navigation. 4) Contextual Left Menu navigation: Once you are in a category, there is now a handy left navigation, which shows the current category and its subcategories. With this, one can easily browse for options without referring back and forth. 5) Facebook 1-Click Login: In addition to “Guest” checkout, we now offer a facebook 1-Click Login, so you can checkout without the hassles of creating an account or entering your email ID. We have ensured that if you already have an account setup (during your previous purchases), you can still go ahead and use the FB Login – both sets of logins would continue to work, even if the email ID is the same! Coming soon : Login via Google Account. 6) Better Category and Product Pages : These now show bigger product images in an uncluttered easy-to-browse manner. You can choose from a wide range of sorting options, and choose how many products you want to view per page, in list or grid fashion. 7) More Product Filters: We wanted to put product-filters which helped the visitor find what she is looking for quickly; rather than cookie-cutter sitewide options. So we now have “Shapes” as a filter in Cakes, “Brand” as a filter in Chocolates and more. These are in addition to a number of under-the-hood changes, which should help us serve you better and more efficiently. We will of-course continue to add newer products and categories to meet and exceed our customer expectations. Please feel free to email us at service@gujaratgifts.com for your valuable feedback and suggestions. If you need any assistance, you can touch base with us at our Customer Support page.